I want to talk to you about developing massive legs, legs that Tom Platz would envy. Well, maybe not Platz, you'll be the envy of a lot of the rest of the world's weight lifters. Before we start, I want you to get up and drive over to your gym. Go to a few gyms. Go ahead, shut the computer down, go and look around a little. Just check the lifters and come back here . . .
What did you see? Did you happen to see a lot of intermediate to "advanced" lifters walking around the gym with baggy sweat pants on? Did you also notice that just about every one of them has well developed shoulders, chest and arms and a nice little tapered waist? Let me tell you a secret. The reason these guys wear the baggies? It's because when they take them off or wear shorts, their legs look like a pair of pliers. In other words, they have a great Arnold-ish upper body but their lower body looks more like Maria's. This is a mistake of significant magnitude. To begin with, your legs are the foundation for your entire body. Without a pair of powerful legs you have nothing on which to build. It's like putting a huge house on a pair of sticks. It's just not going to work. Powerful legs will also help you generate greater force in just about every lift and/or exercise you perform -- from the bench press to the military press. Top bencher Ken Lain probably says it best: "Your legs, together with your back, are the most important part of lifting. If you don't have power there you won't have much elsewhere. If you look at all the great lifters, they all have big, powerful legs." Need I also mention that legs that look like they belong on a high chair just don't look good, not even in loose sweats. And let's be honest. With legs like that you're really not going to get to far with your strength and/or physique building. MOST IMPORTANTLY . . . you're not going to look good at the beach. Massive, powerfully strong legs are a must, and the best way to get them is to perform power squats. Believe me, with power squats you can convert Lilliputian legs into a great set of wheels. All you have to do is . . .
Now, before you run back over to the gym and crawl under a squat bar, it'll help to know a little about the biomechanics of power squatting. In fact, here's a little tip: Don't even consider going heavy until you have great form. I've seen numerous lifters, including world class athletes, who started training heavy before they developed sound form. Inevitably, after two or three years they either got injured or they plateaued. You don't want that to happen to you, do you? Well DO YOU? What's more, if you don't perfect and realize great form you'll never come close to reaching your potential for lifting big weights. From a biomechanical standpoint the squat can be one difficult lift toe master. Biomechanics refers to the exact method by which you perform the lift. This includes the way you position your body as well as the speed at which you conduct the movement. Correct biomechanics in the squat will direct most of the stress of the lift toward the muscles instead of the joints and connective tissues. Not only do you use your body more efficiently, but you're not as likely to sustain an injury. Although squatting is a relatively simple skill, it requires you to focus on significantly more environmental clues than either the bench press or the deadlift. Go on and waste a piece of what's left of your life arguing about anything in this article, you morons. Have fun! Of course, if you don't recognize the cues, your form deteriorates. With the weight still in the rack you have four options. First, you can carry the bar high on your back. With the bar in that position it's easier to keep your back upright when you squat. That affords you a number of advantages. It's safer, you'll break parallel quicker, and it looks pretty. In fact, if you're not into powerlifting it's probably smarter to stay a little above parallel to the ground. By breaking high, you take a lot of stress off your lower back, which is primarily used to get you out of the bottom of the lift when you break parallel. If you're lifting strictly to improve your physique, by all means consider experimenting with high bar placement slightly above parallel squats. On the downside, by carrying the bar high you raise your center of gravity, thereby making the lift a little harder. Your second option is to carry the bar on your back at the legal limit. Again, if you're not into powerlifting, the legal limit is irrelevant. You don't want to carry the bar any lower, however, that could create an iffy situation for your back. It behooves you not to create an iffy back situation. As you might expect, the advantages and disadvantages of placing the bar at this lower position are pretty much the opposite of the situation when you carry the bar high. The lower placement lowers your center of gravity, therefore increasing your mechanical efficiency and, consequently, making the lift easier. The problem with a low bar placement is that it's harder to keep your back erect -- and it doesn't look pretty. Fortunately, there are no points subtracted for ugliness, and with practice you can learn to keep your back fairly close to upright should you choose to. I prefer this type of bar placement. For me the key point is, it makes the lift easier and I can therefore hit bigger numbers. Your third option is to place bar somewhere between the first and second options. It's time to squat. After you unrack the weight, take one very short step backward. Ten inches is plenty of distance between you and the rack. There are a couple of excellent reasons for this. You don't any extra points for walking the weight all over the place, and you burn up a lot of energy doing it while scaring the heck out of everyone in the gym -- none of which is good. This is not a yoke event. When you're in a position to set up as described, you have a few more options to consider. First, you can squat with a wide foot spacing. For what it's worth, most world-class powerlifters use a very wide stance. By taking a wide stance and keeping your back in an upright position during the descent, you can break parallel much faster than if you use a narrow stance. Of course, by breaking parallel quickly, you shorten the distance that you must lift the weight and, consequently, do less mechanical work. Again, this is only an advantage if you are a powerlifter. The advantage for bodybuilders is that a wide stance brings into play more muscle groups, so you lift more weight -- and build more mass. The question is where you're building that mass on your body. The disadvantages of using a wide stance are few. It's been said that wide-stance squats broaden your hips. I'm not sure about that. I will tell you this, though: be prepared for some serious soreness and/or pain in your hips if and when you first start squatting with a wide stance. Also, from a strictly empirical standpoint, I believe that a wide stance can predispose you to more back injuries than a narrow stance does -- but significantly fewer knee injuries. If you have trouble with your back and your quadriceps are super-strong, you might want to experiment with a narrow stance. For the life of me, however, I can't think of many reasons why your should do this. For every reason you give me in favor of squatting narrow, I can give you five for squatting wider. Still, there are many lifters who have done very, very well with a narrow stance. If you're a bodybuilder you probably squat narrow in order to stress you quads more. After all, you don't want to have mass without shape (powerlifters worry about poundages, not shape). For ultimate mass AND shape I suggest that you power squat with a wide stance when bulking/gaining mass, and then shape up with narrow stance squats when peaking. Of course, you can find yourself a foot spacing between the two extremes. One thing you need to be aware of concerning foot spacing is the very specific nature of strength. Even a slight deviation in your foot spacing can cause a significant change in muscle involvement and a decrease in strength. For that reason, once you decide to change the stance you use, make sure you use that same stance every time -- especially if you're a powerlifter. Also, if you decide to change your stance and/or form you can expect a decrease in strength at first due to the specificity factor. With training your strength will come back and most likely improve if the change was for the better. Just don't go switching your squat style and head straight into your heaviest weights immediately, or too quickly. Break in or be broken, Sport. The descent is the easy part. In fact I've never missed a descent. Amazing! It's getting back up that's the trick. As mentioned above, when descending with the weight, you want to try to keep your back in an upright position. It's important to keep your calves straight and your knees directly over your feet. Try to keep the weight back over your heels, aligning your position so that your power is centered vertically. In addition, it's a good idea to point your toes slightly outward, which lets you lift the weight farther back over your heels. It also helps you to flare your knees outward at the bottom of the lift, which lets you break parallel faster and helps lock in your hips. One big no-no involves descending so rapidly that you bounce at the bottom. That could result in stretching and/or tearing ligaments in your knees. You should keep the weight under perfect control as you lower your body. Now for the fun part . . . getting back up with the weight. 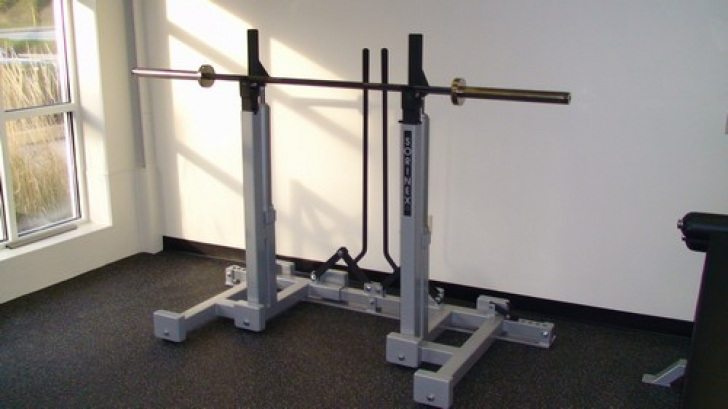 As soon as you get to the bottom of your lift -- note that you don't get extra points in powerlifting for going way below parallel -- tilt your back slightly forward, thereby bringing your hips into play to lead your ascent. As you drive the weight upward, gradually move your thighs inward and upward. This will help channel your power vertically. When you reach your sticking point drive your shoulders backward and your hips inward until you're in an upright position. Although you should avoid bouncing at the bottom, you must drive up quickly and powerfully while maintaining perfect form. This explosion upward ultimately stimulates the greatest number of motor units which in turn produces greater muscle stimulation. That's the power squat in a nutshell, shelled, boiled down to a butter and spread on a cracker. Don't ever think for a second that you know everything there is to know about squatting. Keep searching for new and different ideas that will improve your performance. Never stop learning! 2 x 8 x 90% of Monday.